NEW YORK (AP) — John Petty scored 16 points to spark No. 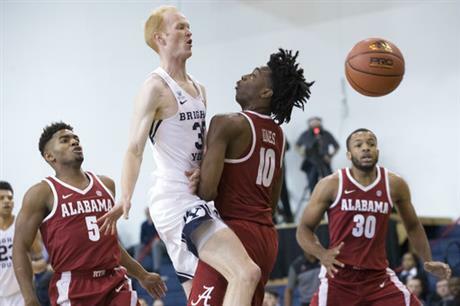 25 Alabama to a 71-59 win over BYU in the second game of the Barclays Center Classic on Friday. Dazon Ingram added 15 for Alabama, which improved to 5-0, the best start for the Crimson Tide since 2012-13, when they began 6-0. Donta Hall had 12, and Collin Sexton finished with 10. BYU fell to 3-2 with its second loss in its last three games. Yoeli Childs led the Cougars with 21 points. In his third season, coach Avery Johnson is attempting to build Alabama into a program that can compete on a national level. And the matchup against BYU displayed why the Crimson Tide could be an intriguing team this season. Alabama was able to build a 15-point lead in the second half following Riley Norris’ layup layup with 10:43 left. Part of that was because of the Crimson Tide’s ability to pressure BYU defensively. Alabama recorded six blocked shots and forced 11 turnovers. But program building does mean growing pains. And the Crimson Tide’s youth also revealed itself in the second half. 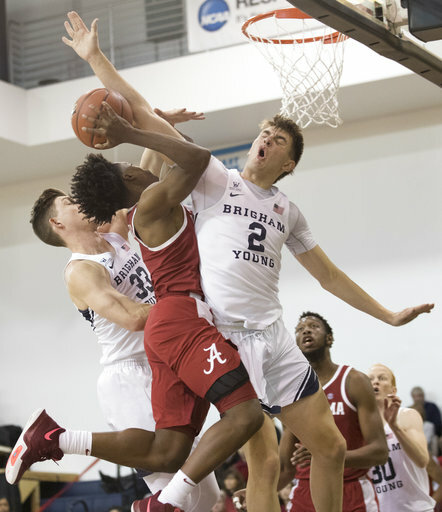 Following Petty’s 3 with 7:35 left, which gave Alabama a 61-47 lead, BYU outscored the Crimson Tide 8-2 in a span of 1:21 to cut the deficit to 63-55. Dalton Nixon made two free throws and Zac Seljaas made consecutive 3s for the Cougars in that stretch. BYU got back into the game in part because of questionable shot selection in the second half from the Crimson Tide, who made 18 of 30 shots from the field before halftime. Eight points was as close as BYU would get. Ingram knocked down two free throws, and Hall’s tip-in in the final two minutes gave the Crimson Tide the margin of victory. Alabama: Size matters. At least it does to the Crimson Tide. Alabama has 11 players 6-foot-5 or taller. That size and length allowed Alabama to create turnovers and contest shots, leading to fast breaks. BYU: It may not be fair to say as Elijah Bryant goes, so does BYU. But Bryant, who entered the game averaging 21.5 points, was limited to three points in the first half and five for the game. The Crimson Tide entered the game having won their first four by an average of 18 points per game. Moreover, Alabama was holding opponents to .411 shooting from the field and .338 shooting from 3-point range, while blocking 6.8 shots and forcing 7.3 steals in those games. … The Cougars fell to 0-2 all-time against the Crimson Tide. In the only other meeting, BYU dropped a 77-74 decision on Dec. 30, 1957. Alabama: Will play No. 14 Minnesota Saturday in the Barclays Center Classic. BYU: Will play Massachusetts Saturday in Brooklyn.